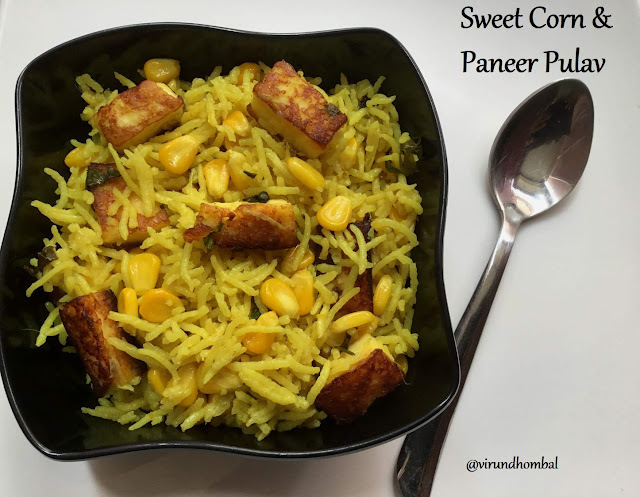 Sweet corn and Paneer Pulav- simple and easy pulav with mild flavours. 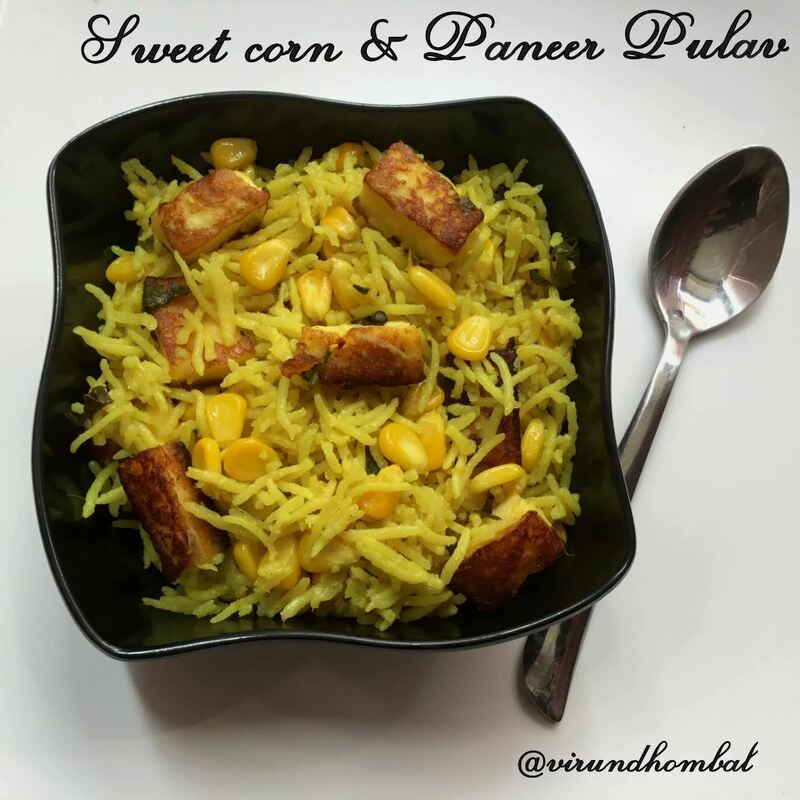 This Pulav is best for kids lunch box as they like both the sweet corn kernels and paneer cubes. The freshly ground ginger, garlic and green chilly paste adds a beautiful colour and a wonderful flavour for the Pulav. 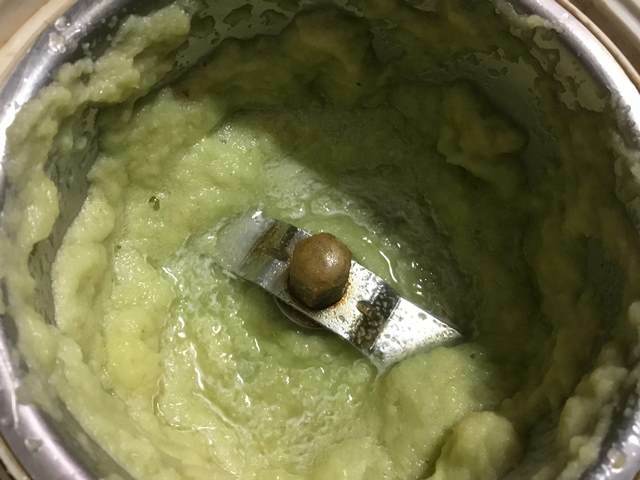 So please do not skip the ground paste or do not use ready made paste. 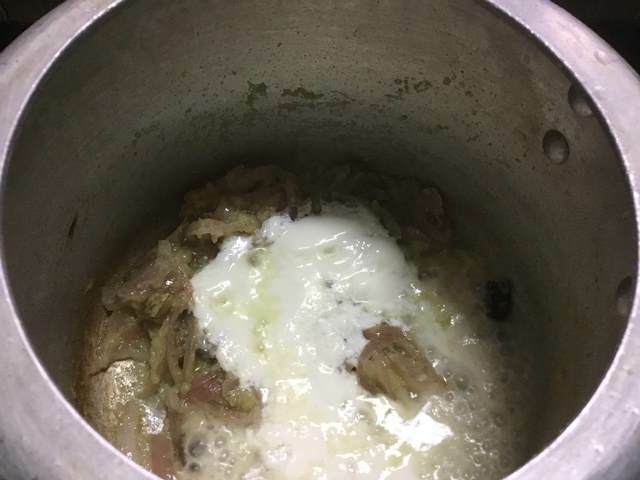 In this Pulav, I have not used either tomatoes or lemon juice instead I have added thick curd while sauteing the onions. 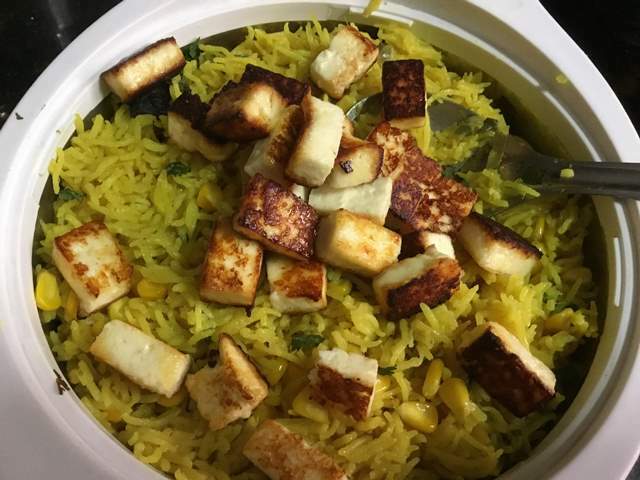 After cooking the Pulav, the paneer cubes are sauted in ghee or oil and then added to the rice. 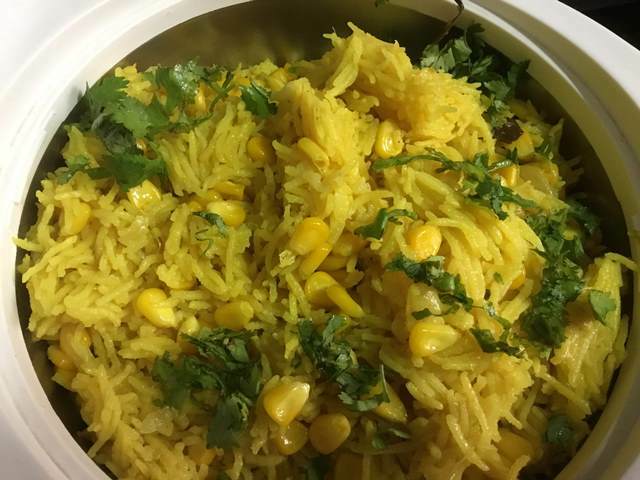 In this Pulav also, I have used the most common basmati rice, but you can use jeera samba rice or ponni raw rice. When it comes to biryani or pulav the cooking method is easy and requires some attention while adding the water. If you soak the rice for 20 to 30 minutes, then 1.5 cups of water is perfect for 1 cup of rice. 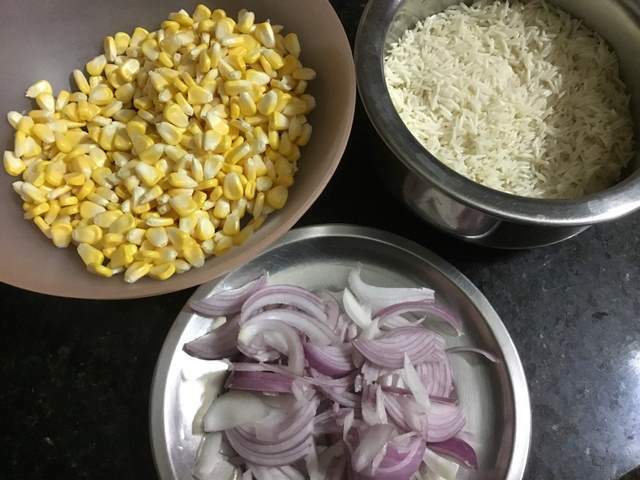 Now let's see how to prepare this easy and tasty pulav with step by step photos. Peel the garlic cloves and ginger. 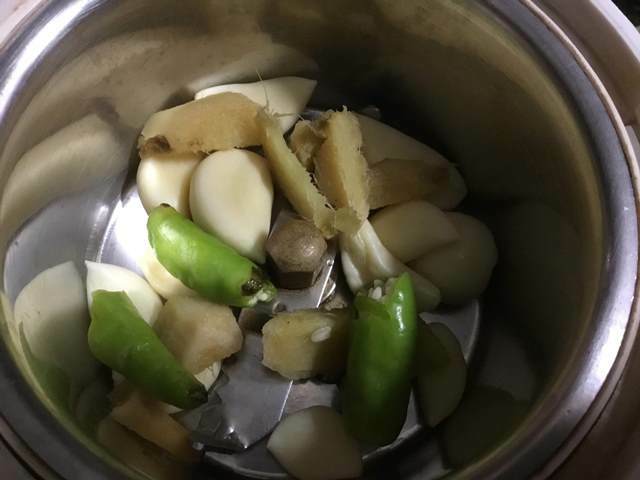 Take a small chutney jar and add the garlic cloves, ginger and green chillies. Add 2 tbsp water and grind it nicely. Heat 2 tbsp ghee in a pressure cooker. 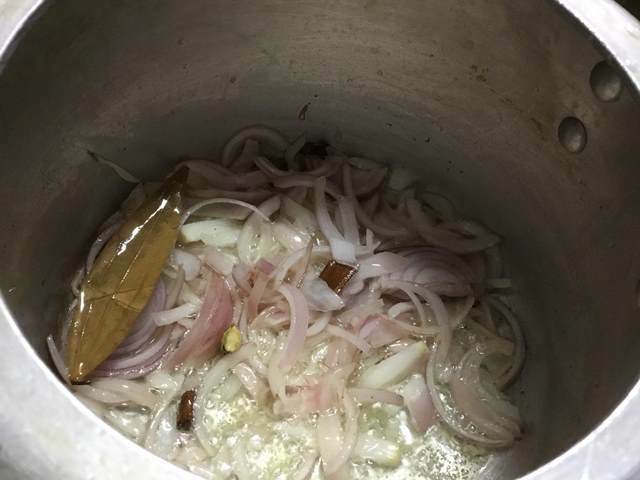 Once the ghee is hot enough, add bay leaf, cinnamon, cloves and cardamom.Then add the onions and saute them well. Next, add the ground green chilly ginger garlic paste and saute until fragrant, stirring constantly. Add the thick curd and stir it continuously for a few minutes. 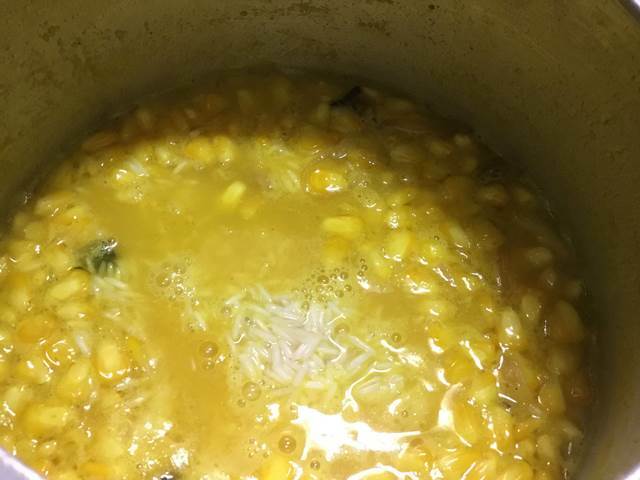 Next, add in the sweet corn kernels and stir to combine with the onions. 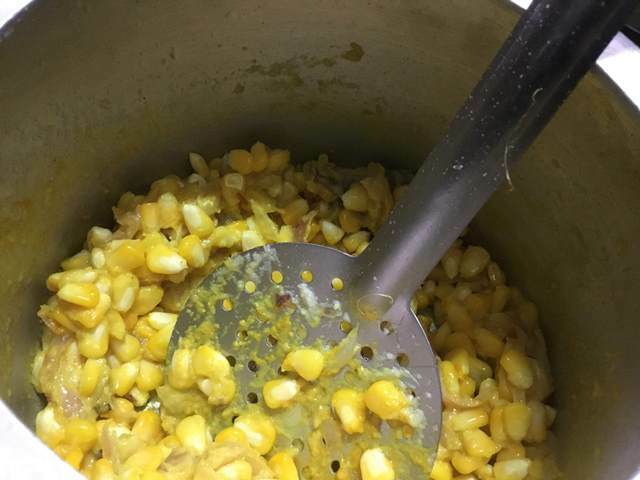 Cook until the corn kernels changes its colour to bright yellow. Measure and pour 1.5 cups of water and required salt. Stir them well and when it starts to boil, add the drained rice. Mix them gently and close it with the lid. Reduce the heat to low and pressure cook for 7 to 9 minutes or turn off the heat after 2 whistles. Take the pressure cooker from the stove top and keep it on your kitchen counter top. Allow the pressure to settle down completely. 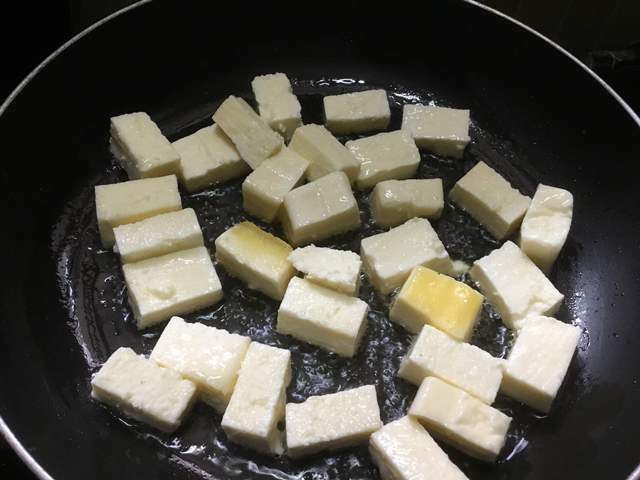 In the meantime, cut the paneer into medium cubes. Heat ghee in a flat nonstick pan on low heat. 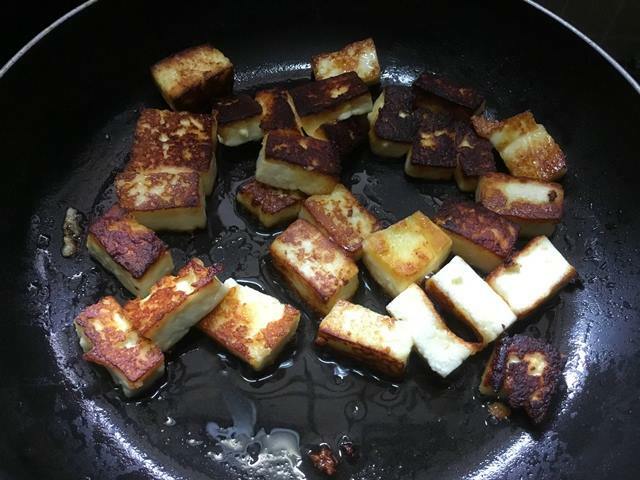 Place the paneer cubes and toast each cube gently. When it starts to brown on the downside, gently flip them and continue to toast. After a few minutes, toast, it's sides and transfer it to a plate. Now open the pressure cooker and transfer the Pulav to the serving dish. Garnish with chopped coriander leaves. Finally, add the roasted paneer cubes and mix them well with the rice. Serve it warm with a vegetable salad. Wash and soak the rice with 1/2 cup of water for 30 minutes. After 30 minutes, drain the water completely. Keep the sweet corn kernels and onions ready for cooking. Heat 2 tbsp ghee in a pressure cooker. 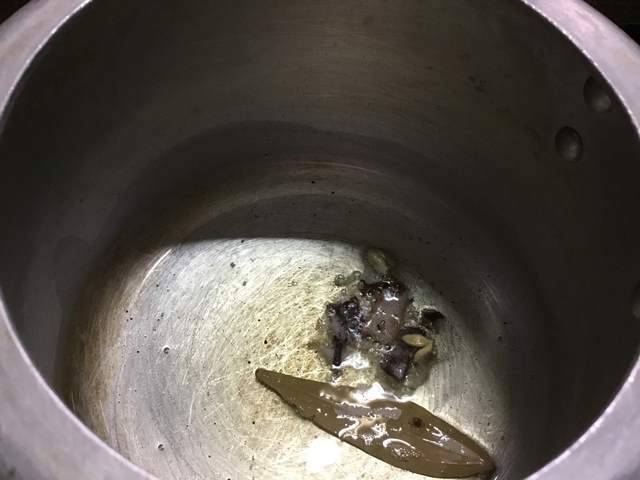 Once the ghee is hot enough, add bay leaf, cinnamon, cloves and cardamom. 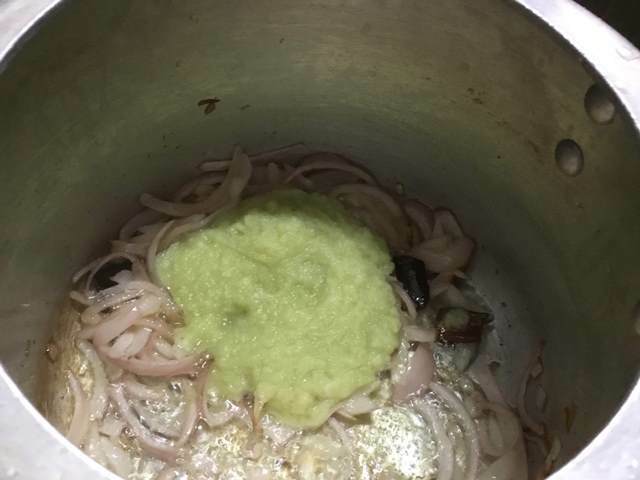 Then add the onions and saute them well. Add the thick curd and stir it continuously for a few minutes. 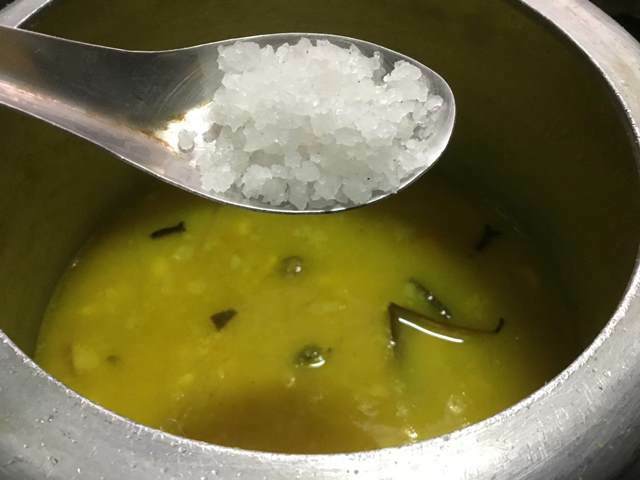 (Use thick curd for this rice). Next, add in the sweet corn kernels and stir to combine with the onions. 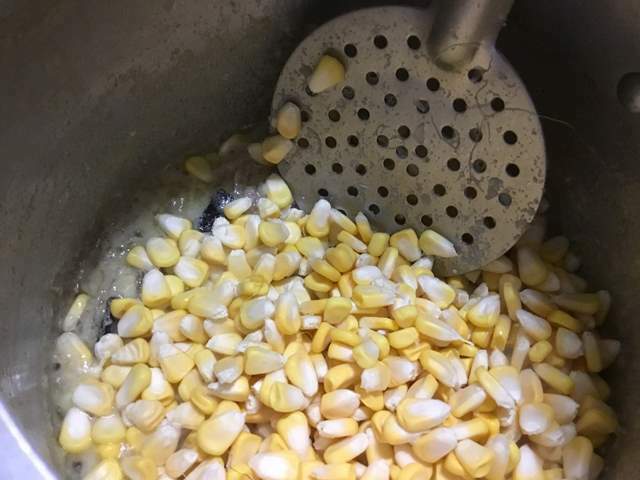 Cook until the corn kernels change its colour to bright yellow. Measure and pour 1.5 cups of water and required salt. Stir them well and when it starts to boil add the drained rice. Mix them gently and close it with the lid. In the meantime, cut the paneer into medium cubes. Heat ghee in a flat non stick pan on low heat. When it starts to brown on the downside, gently flip them and continue to toast. After few minutes, toast it's sides and transfer it to a plate. Now open the pressure cooker and transfer the Pulav to the serving dish. Garnish with chopped coriander leaves. Finally, add the roasted paneer cubes and mix them well with the rice. Serve it warm with a vegetable salad or onion raitha.